Notorynchus cepedianus is a member of Hexanchiformes (cowsharks), a clade widely considered to be among the more primitive of the living sharks. J. Frank Daniel, in his classic work "The Elasmobranch Fishes", used the anatomy of Notorynchus as the basis of comparison for other sharks and rays. The specimen shown here is in fact one of Daniel's originals from the California Academy of Sciences, and is remarkably well preserved. A detailed description is presented of the neurocranium in the hexanchiform shark Notorynchus cepedianus, a primitive modern elasmobranch (neoselachian). The study is based on high-resolution CT scanning and digital imaging, which revealed both the external and internal morphology of a wax-impregnated braincase. 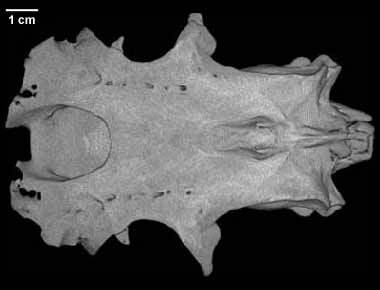 Besides providing new data concerning Notorynchus and neoselachians generally, the investigation also provides a control for establishing the reliability of morphological observations of fossil elasmobranch braincases based on CT scans. Many of the features described here have considerable phylogenetic potential, although comparative CT scan data are still unavailable for most modern and extinct elasmobranchs. The elasmobranch inner ear is highly specialized toward low-frequency phonoreception, and many derived elasmobranch characters can be recognized in the skeletal labyrinth. One of the most obvious is separation of the posterior semicircular canal; it remains connected to the rest of the labyrinth only by a single opening, and the canal forms an almost complete circuit. This and other modifications of the labyrinth can be recognized in the CT imagery, and the morphology of the skeletal labyrinth and other endocranial spaces can be reconstructed with great accuracy using various image processing techniques. The specimen was scanned by Richard Ketcham and Matthew Colbert on 12 March 1999 along the coronal axis for a total of 492 512x512 pixel slices. Each slice is 0.25 mm thick, with an interslice spacing of 0.25 mm and a field of reconstruction = 95 mm. Cappetta, H. 1987. Chondrichthyes II: Mesozoic and Cenozoic Elasmobranchii; pp. 44-50 in H.-P. Schultze (ed. ), Handbook of Paleoichthyology Vol. 3B. Stuttgart, Fischer. Compagno, L. J. V. 1973. Interrelationships of elasmobranchs; pp. 15-61 in P. H. Greenwod, R. S. Miles, and C. Patterson (eds. ), Interrelationships of Fishes. Academic Press, London. Daniel, J. F. 1934. (first published in 1922) The Elasmobranch Fishes. University of California Press, Berkeley, California. Maisey, J.G. 2001. Remarks on the inner ear of elasmobranchs and its interpretation from skeletal labyrinth morphology. Journal of Morphology 250:236-264. To cite this page: Dr. John Maisey, 2001, "Notorynchus cepedianus" (On-line), Digital Morphology. Accessed April 25, 2019 at http://digimorph.org/specimens/Notorynchus_cepedianus/.